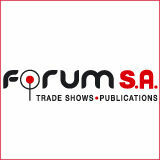 THE FASTEST GROWING FOOD & BEVERAGE EXHIBITION IN THE WORLD! OOD EXPO EXPO has been constantly growing, in both size and reputation, thus giving tangible shape to the aspirations of the Greek as well as the international food industry. Approximately 1,300 companies will be presenting the broad spectrum of products, fields of application and services on an exhibition space of 50,000 m2, for buyers from the entirety of the F&B sector. FOOD EXPO 2019 will once again be filled with great energy, top buyers, and, of course, fabulous foodstuff. The show will take place March 16-18, 2019, at the Metropolitan Expo in Athens, Greece. Buyers from top names in retailing and foodservice will be out in force in search of new products, new trends, new vendors, and new connections to help meet record consumer demand for Greek, Mediterranean and specialty foods, in general. As always, FOOD EXPO 2019 will be the central platform for the international food industry interested in Mediterranean products. 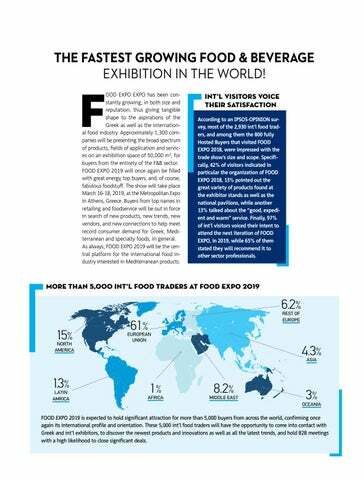 INT’L VISITORS VOICE THEIR SATISFACTION According to an IPSOS-OPINION survey, most of the 2,930 int’l food traders, and among them the 800 fully Hosted Buyers that visited FOOD EXPO 2018, were impressed with the trade show’s size and scope. Specifically, 42% of visitors indicated in particular the organization of FOOD EXPO 2018, 13% pointed out the great variety of products found at the exhibitor stands as well as the national pavilions, while another 13% talked about the “good, expedient and warm” service. Finally, 97% of int’l visitors voiced their intent to attend the next iteration of FOOD EXPO, in 2019, while 65% of them stated they will recommend it to other sector professionals. FOOD EXPO 2019 is expected to hold significant attraction for more than 5,000 buyers from across the world, confirming once again its international profile and orientation. These 5,000 int’l food traders will have the opportunity to come into contact with Greek and int’l exhibitors, to discover the newest products and innovations as well as all the latest trends, and hold B2B meetings with a high likelihood to close significant deals.